Cat JewelryThere are 11 products. Do you like cats of all sizes, shapes and colours? Then you are also going to love this handmade and ooak cat jewelry, especially if you are a true cat lover. Cat jewelry represented on this site makes a perfect birthday gift for all people who love cats, but you can also present this cat jewelry to people on any other special occasion. believe me, they are going to love it :) I am a huge cat lover, too and I already wear many pieces of cat jewelry - cat rings, cat earrings, cat necklaces, pendants and cat bracelets. In this category of cat jewelry you are also going to find sets of cat jewelry and I can also make a very special cat jewelry on your request. Just write me at info@unikatnica.com (Nina) and I'll get back to you asap. An ooak and handmade set of cat jewelry - a cat ring and earrings in black and white color, with handmade motif of white cats and wire trees. The set of cat jewelry makes a unique and useful gift for all cat lovers. IMPORTANT! Before purchasing this lovely cat jewelry, register/log in to Unikatnica. 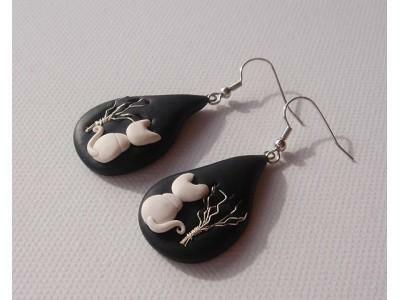 Lovely white and black cat earrings with handmade and ooak motif of black cat's head. The cat earrings represent a very unique and special gift for all cat lovers. IMPORTANT! Before purchasing these amazing cat earrings register/log in to Unikatnica. These lovely cat earrings with a black and white motif of handmade cats and wire trees make a very original and beautiful gift for all cat lovers. IMPORTANT! Before purchasing these amazing cat earrings register/log in to Unikatnica. This ooak black cat pendant with handmade and ooak cat makes a perfect birthday present, no matter whether you give it to a man or a woman. This cat pendant is ooak and you can wear it on almost all colors of your clothes and other fashion accessories. IMPORTANT! Before purchasing this amazing black cat pendat register/log in to Unikatnica. This ooak cat pendant with handmade silver&grey cat repersents a unique and thoughtful gift for all cat lovers. You can present this cat pendant as a birthday gift or give it for any other occasion. IMPORTANT! Before purchasing this lovely cat pendant, register/log in to Unikatnica. This ooak cat pendant with handmade and handpainted cat in whiet, pearl and black is an astonishingly wonderful and special gift for all cat lovers. You can present it for a birthday or any other special occasion. IMPORTANT! Before purchasing this beautiful cat pendant, register/log in to Unikatnica. This ooak cat pendant with handmade white cat, wire trees and white birds looks astonishingly beautiful and very special. It makes a perfect original gift for all cat lovers. IMPORTANT! Before purchasing this beautiful cat pendant, register/log in to Unikatnica.